I love that two of the big trends this season are bold and colorful and chic and understated. While they may seem like opposites they're both styles I love to wear. I decided to give my jeans and button up a 70s inspired feel by wearing blue on blue with tan accents. I plan to wear this mix through out the spring and summer. It feels so clean and cool. This look was also influenced by one of my favorite editorials from last year Americans in Paris. I really love the simplicity of this outfit!! You look insanely chic, per usual! 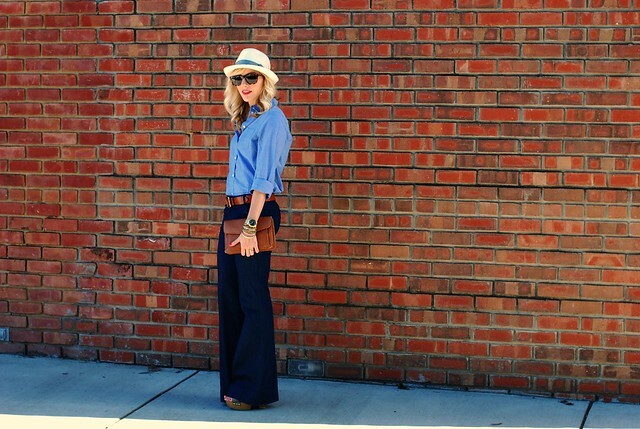 I love the fedora on you, and the blue-on-blue look is fantastic... Also adoring the 70s inspiration! I really love this outfit - simple, chic & classic! Perfection! love this entire look! that clutch is adorable too, where's it from?? also, it could just be the curls, but it looks like you've dyed your hair. either way it looks awesome! I love the jean on jean style and you wore it so well with the hat, chunky heels and tan bag. Love this look! so simply yet chic!! you've done it again! You are ridiculously inspiring. I love this look to bits and pieces! Great look, the lipstick is the cherry on top! Love those pants, too. your outfit is amazing, i wish i felt comfortable in button up shirts like that. it looks great. You look gorgeous. this combo of colors is also one of my favorites! The blue on blue looks fantastic on you! And those platforms are truly statement shoes. this might be one of my favorites so far! i love all the tan you worked through this outfit. and what nail polish do you use? Beautiful!! This outfit is exactly what I hope my spring "uniform" will be, and I am totally in love with that hat! 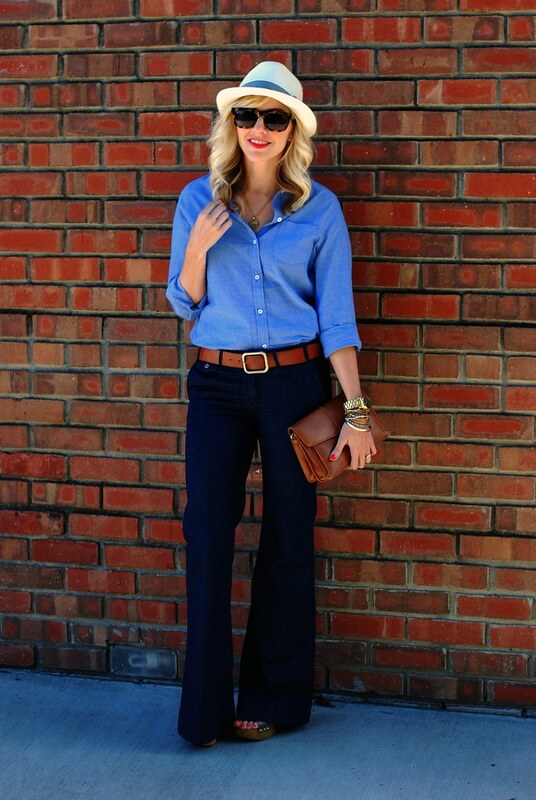 Love this combination of shirt and jeans! i love that shirt and the clutch is so cute! you're a classic beauty, as always! i think this is the best denim on denim look i have seen yet! 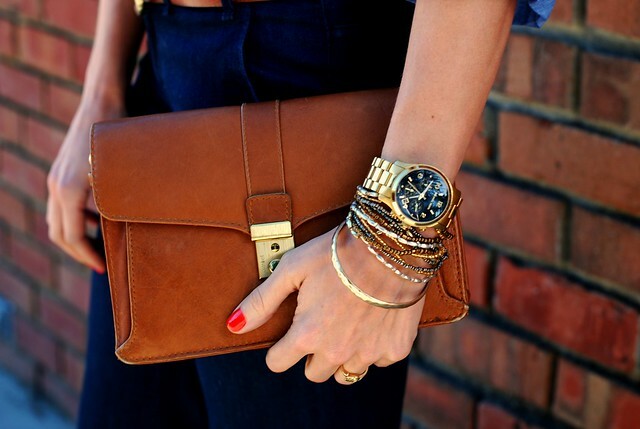 LOVE your clutch! Cute shirt...have one I got gifted for xmas that I cannot wait to debut. Super cute! Lovin those shoes!! This look is so great and can be worked many was. Love how you rocked it! Great look! It is even work appropriate which I love. Is that a new watch? I love the dark face. Love the 70's vibe of this outfit and the mixed denims. Love this post! So very Americana. And that bag! Perfection to a T! You are so beautiful and natural. Lovely. I'm in love with this outfit and you look absolutely gorgeous. So clean and crisp but with a little 70's vibe. I loved that editorial as well!!! You look amazing!! Gorgeous! I love that clutch - where is it from? Great outfit, looks quite easy but the details are stunning! Simple, chic, lovely. Doesn't get much better. I looove this look! Everything is perfect together. That clutch is amazing on its own too. What is your bag? It's so cute! This is classic at its best! These photos are so stunning. Seriously, you look gorgeous in this clean and classic look. And, I waaaaant those sunglasses! Submitting another request for you to tell us the source of your clutch! 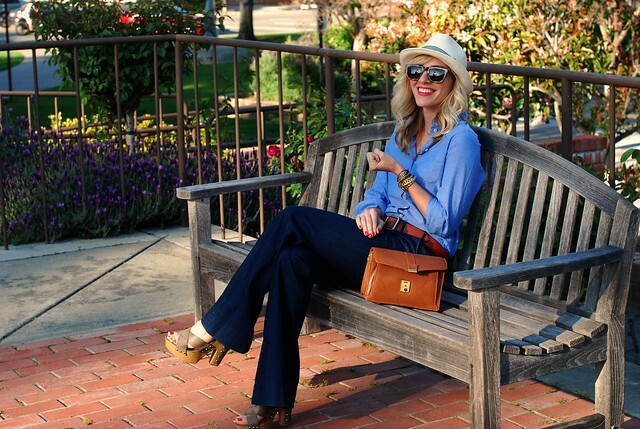 Whole ensemble epitomizes effortless styl -- yay, you! you are beyond adorable in your blues...love this post! This is a fun casual look! 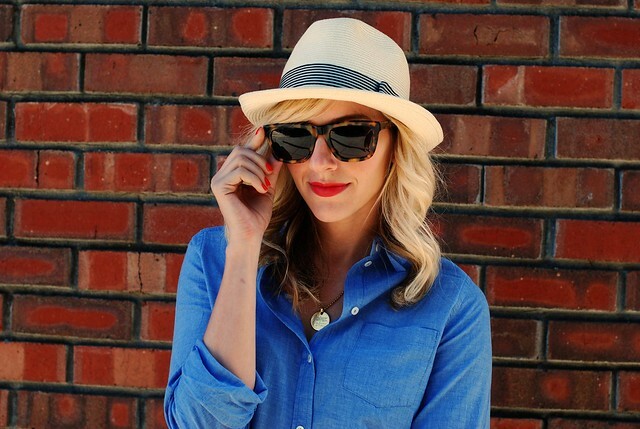 I am loving the Chambray shirt paired with the dark denim! Taylor! You look amazing, I love it all! This look is so pulled together, and the accessories are a great touch! Have a lovely week! The blues and the brown match so well together. Love this look. This outfit is gorgeous. I'm obsessed with your sunglasses so great! I really need to get a pair of karen walkers one of these days. By the way, I've e-mailed you a couple times about sponsoring and never got a response. Just wanted to remind you. Such a chic outfit and I adore the sandals!! Just got those Gap jeans and I love them! They look great on you! I recently bought a pair of flare jeans and this gives me some great inspiration on how to wear them! P.S. Make sure to check out my blog today for a really awesome discount and free shipping on some adorable clothes from Lulus.com! You look incredible!!!! Love the brick background... your pics look so great!! love that bag! I don't think you listed it. where's it from? I love this outfit! So put-together, classy, and casual! I love the structure of the purse. So simple, casual and comfortable looking! Great combination for a Monday. Thanks everyone!! This outfit was so fun and easy! The clutch is vintage and I found it on Etsy. @Sophie, thank you! That means a lot to me! I ♥ this outfit !!! Taylor, this is my favorite outfit of yours to date. PERFECTION. I have the same shirt, but you manage to look a lot better in it than I do, LOL Maybe I need to iron mines! Just found your blog. Loving it! I'm very health conscious as well. I run and have trained in Kung Fu for about a decade. But like you, I love fashion and a good cookie! Very simple and chic outfit. love this look... you wear the blues so well! I totally love your Gap jeans, they're a perfect fit! And your bangles and purse are perfect accent pieces together! you look so chic! I love how genuinely happy you are in the pic on the bench! loving you in 70's vibe clothing....gorgeous! A classically great outfit : ) Love the shades! how recently did you get the H&M shirt? i love it! The epitome of 70s chic--love it! Your hair looks so pretty here! And I'm loving the whole hair/hat/sunglasses combo! Such a laid back 70's glam look happening here! i love this look!! you look amazing, the hat, shirt, belt, jeans, shoes..it's all so perfect! i think we have a friend in common, tammy + bryce? she was telling me about your blog and I didn't realize until now that it was you! Love the seventies feel of the outfit! The color combo is great!